Assistant Posts on or before 20-08-2018. Candidates must have 50% of marks in their graduation. An objective type and descriptive test and interview will be conducted for Assistant posts candidates selection of HCL Recruitment 2018. Online applications will be available from 26-07-2018 to 20-08-2018 and final stage on online form submission is 06-09-2018. Official website to apply online for this HCL Recruitment is www.hckrecruitment.nic.in. Written Exam Pattern and Syllabus for Objective type and descriptive type tests, age limits, how to apply online, salary and other details are given below. 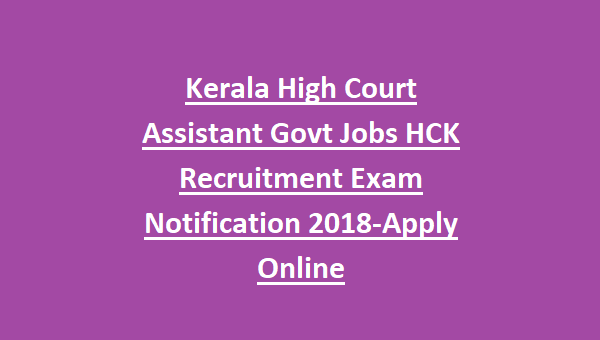 There are total 38 posts in this HCK Assistant recruitment 2018. Candidates must have qualified Degree with 50% of Marks. Desirable qualification is Computer Knowledge. For general candidates those are who born in between 02-01-1982 and 01-01-2000 they are eligible to apply online. For SC/ST candidates 5 years and for OBC candidates 03 years of age relaxation is applicable. Candidates selection is based on objective type written test, descriptive type test and interview. Objective type test will be conducted for 100 marks and exam duration is 75 minutes. Exam will be OMR based. Total 100 questions will be given and each question carries one mark. (c) Basic Mathematics – 20 marks. Descriptive test will be conducted for 40 mark and exam duration is 30 minutes. Descriptive test consists of Precis, Letter Writing and Essay. 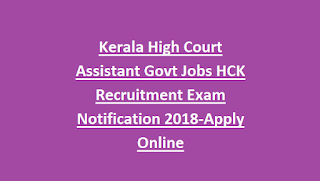 Interested and Degree 50% of marks having candidate can submit their application form online through official website of Kerala High Court @www.hckrecruitment.nic.in. Last date to apply online is 20-08-2018 for step 1 process. Final submission date after the fee payment is 06-09-2018. Exam date, admit card released date for this HCK Recruitment will be updated in www.hckrecruitment.nic.in website.